It is a sad but inescapable fact that the most significant heir in the period 1815-1914 is the Archduke Franz Ferdinand – the man whose assassination triggered World War 1, which led to the rise of Communism and Hitler, then to World War 2 and, let us not forget, the civil war in former Yugoslavia and even the debacle taking place in the Ukraine at time of writing. That’s quite a catalogue of major world incidents to place at the feet of one man – and it could be argued that most would have taken place had Franz Ferdinand not been shot … one of the favourite “what ifs” of history. But was Franz Ferdinand as significant in his own lifetime? In fact, who was he? To most schoolchildren he is a fact they have to learn to pass their History GCSE, to most 20-somethings he is the name of a pop group, to most 40-somethings he is Baldrick’s joke in Blackadder “some bloke called Archie Duke shot an ostrich because he was hungry”. When Franz Ferdinand was born in 1863, he was just an average Archduke in terms of rank, and was not expected to amount to much more than a leading member of the Austrian army. His father was Archduke Karl Ludwig, a younger brother of the Emperor Franz Joseph. Franz Joseph succeeded as Emperor during the revolutionary year of 1848, taking over from his enfeebled Uncle, Ferdinand I, and bypassing his lacklustre father, Franz Karl. He was young, he was seen as a fresh, dynamic new start for Austria. He married a beautiful Bavarian Princess, Elizabeth (known as Sissi), who, in 1858, gave birth to an heir, Archduke Rudolf. At the time of Franz Ferdinand’s arrival, it was expected that Sissi would give birth to more children, that Rudolf would not be his father’s sole male heir and even if he were, he would go on to have sons himself. And then there was Archduke Maximilian, the brother in between Franz Joseph and Karl Ludwig in age. In 1857 he married Princess Charlotte of Belgium. They surely would have children, too. Thus Franz Ferdinand was the first son of a third son, low in the pecking order of who would succeed to the throne – pretty insignificant. Archduke Karl Ludwig was a loving, pious family man. 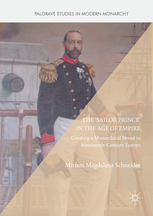 He was not ambitious to be involved in ruling or the military – unlike Maximilian who achieved a leading role in the navy, or their cousin Archduke Albrecht who carved a career in the military and became Inspector General of the Army. Karl Ludwig quietly supported the Emperor by living the life of a rich nobleman and creating no scandal. He had “none of the Habsburg arrogance”  to quote Princess Catherine Radziwill. It was not all comfort though – his first wife, Margaretha of Saxony, died after only two years of marriage in 1858. His second wife, Maria Annunciata of the Two Sicilies, the mother of three sons and one daughter including Franz Ferdinand, died at the age of 28 in 1871 from consumption. Karl Ludwig sincerely mourned both wives but decided that his children needed a mother figure in their lives, and in 1873 married Maria Theresa of Braganza. He could not have chosen a better wife. She was over twenty years younger than her husband and only eight years older than Franz Ferdinand, but she did her utmost to be a good mother to Karl Ludwig’s children and they sincerely loved and admired her. She went on to have two daughters of her own, Maria Annunciata in 1876 and Elisabeth in 1878. Karl Ludwig educated his son to be a good archduke to reflect his own image. He appointed Count Ferdinand Dengenfeld as his governor – a former army officer, very reactionary and unimaginative. Lessons included arithmetic, grammar, sciences, geography, the languages of the Empire, fencing, swimming, history, literature, music and religion – lots of religion. In fact, lots of lessons in lots of subjects. It was too much both in breadth and demand for the student himself, who was no academic. Franz Ferdinand was diligent but not really engaged, and came away with a passing knowledge of many topics but no real depth of understanding of any. And he spent much time in his studies alone, being tutored at home. This, compounded with the loss of his mother, helped to mould him into a retired, quiet, shy personality. He was as pious as his father too. And it did not help that his younger brother, Otto, was always so much more popular, clever, handsome and outgoing than Franz Ferdinand. In 1881, Crown Prince Rudolf married Princess Stephanie of Belgium – in a marriage bartered through the foreign court by the Austrian Ambassador to Belgium, Bohuslav Chotek. It was certainly a happy marriage at first and in 1883 they had their first child, Elisabeth. Then things started to fall apart – Rudolf became unfaithful, unstable, and in 1886 seriously ill. The couple were sent to recuperate to the island of Lacroma (present day Croatia, just off the coast of Dubrovnik). By the time they arrived, Stephanie was ill, too. She details in her memoirs that she was “suffering terrible pain”. Doctors were summoned, peritonitis was diagnosed and Franz Joseph ordered that the doctors were not to release this information to anyone. Much care was taken of Stephanie and she recovered . But she was unable to have any more children – she later told her secretary, Julia von Stockhausen, that she had been infected by Rudolf and her fallopian tubes destroyed. Rudolf had almost certainly given his wife gonorrhoea. He did not recover, in fact, he got more and more ill, and may well have had syphilis as well as gonorrhoea . And he started taking large doses of morphine to help with the pain. It was common knowledge at the Court that Stephanie would not have a son. Franz Ferdinand was another rung up the ladder of significance. Rudolf knew he was incurably ill. He knew he had destroyed his marriage and his chances of having an heir. He knew he had let his country down. It was all too much for this fragile man and the inevitable happened. He invited his new young besotted mistress, Baroness Marie Vetsera, to join him in this hunting lodge, Mayerling, in the Vienna Woods. On the night of 29/30th January, 1889, Rudolf shot Mary, then he shot himself, in a bizarre suicide pact. Franz Ferdinand was now the son of the heir to the throne. In reality, he was the heir to the throne. Karl Ludwig had no intention of becoming Emperor and it was widely believed he would step aside and let Franz Ferdinand take over if he outlived his brother . Rudolf had been a popular figure. No one knew who this new heir on the scene was – the press and public were suspicious. Franz Joseph did not help. He had never much liked his reserved nephew and their first meeting after Mayerling was uncomfortable for both, “I have never been treated so coldly before. It seems the mere sight of me awakens unpleasant memories”, Franz Ferdinand complained . To emphasise how difficult Franz Joseph found it to accept Franz Ferdinand as the heir, he never made him Crown Prince. He was always, even up until 1914, known as the “Thronfolger” or heir to the throne, as if to emphasise his insignificance. Even Franz Ferdinand felt insignificant. He was aware that his education was not good enough to equip him to be Emperor. He knew he would have to curtail any aspects of his lifestyle that could be called “hedonistic” – especially with the example of Rudolf before him. He buckled down to being sensible. 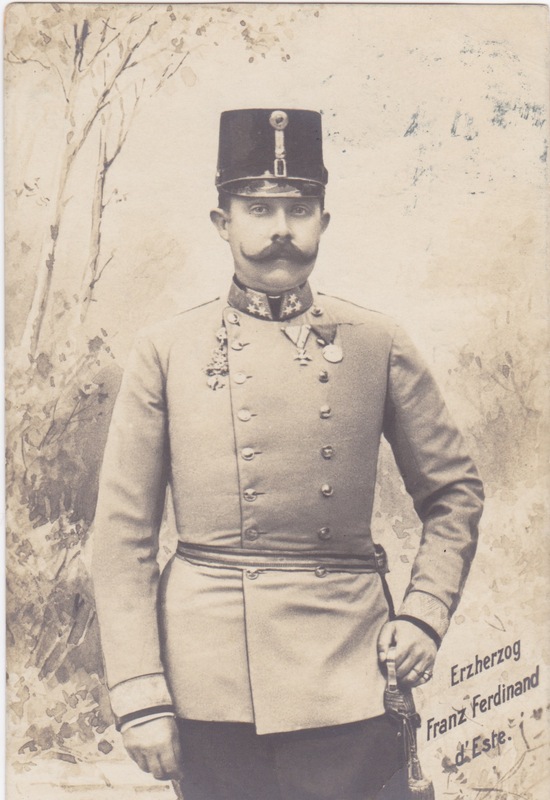 He was promoted to Colonel in the army and given command of the 9th Hussars Regiment stationed at Ödenburg (now Sopron) in Hungary for two years. He was sent on official visits to Stuttgart, St Petersburg and Berlin .Then he hit on the idea of a round the world trip to get to learn about the policies and peoples of the countries he would have to deal with once he was Emperor. Franz Joseph saw this as a jolly but eventually agreed to let his nephew go. India, Australia, Japan, Hong Kong, and America were visited. And it was America that really made an impact on Franz Ferdinand. It was not a country he liked – the press pursued him relentlessly and he was appalled at how the poor were left to starve, “For the working class,” he wrote, “freedom means freedom to starve” . But he was very impressed with the idea of a union of federal states under centralised authority – this could work very well as a model to keep the Austro-Hungarian Empire together. If Franz Joseph was still ambivalent to his heir, there were a number of eligible young Princesses and their mothers who were not. Princess Mathilde of Saxony was suggested. And rejected. On a visit to the British court in 1894, Franz Ferdinand was relentlessly pursued. “… the designated fiancées moved about in a great herd and showed worrisome levels of persistence. I sat next to one of the victims on the prowl”, he wrote to a favoured friend, Countess Marie Thun-Hohenstein née Chotek . Franz Ferdinand was not looking for arm candy – he did not want to replicate the mistakes made by Franz Joseph and Rudolf. He wanted to marry someone like his stepmother – good, kind, supportive, intelligent and someone whom he actually loved. He knew himself well enough by now to know the personality of the wife he needed to help him become a good Emperor – “she should not be too young and her character and views should be fully mature. I know of no such princess” . Just as our insignificant Archduke was gaining some confidence and understanding of his new role, fate dealt him a cruel blow. He developed tuberculosis – the dread disease that had killed his mother. There was nothing for it but for him to be put under the supervision of a specialist doctor and to recuperate in climates warmer and less polluted than Vienna. He was sent to the Tyrol, to the south of France and to Egypt. He was forced to spend hours and hours just resting – but it worked. He recovered completely although it took a good two years – a miserable and frustrating two years for it seemed that all he had worked for was lost to him. Back in Vienna, Franz Ferdinand’s younger brother Otto had not hesitated to step into his shoes. He was another Rudolf – popular, charming, unhappily married and a victim of venereal disease. Both the Lord High Chamberlain, Prince Alfred Montenuovo, and the Foreign Minister, Count Agenor Goluchowski, supported Otto. Otto started carrying out official duties in the Emperor’s name. He was given a palace to live in whilst Franz Ferdinand just had a suite of rooms at the Hofburg. It was he and not Franz Ferdinand who entertained the Russian Imperial couple on their official visit to the court. To Countess Marie, Franz Ferdinand wrote, “I am deeply wounded and angry at being treated, although I am still alive, as if ‘past my expiration date’ ”  And yet Franz Ferdinand was nearer than ever to the throne – his father died in 1896, so now he was officially the heir. By 1897, Franz Ferdinand was back at court and trying to reestablish himself. He was made Colonel-in-Chief of the 7th Regiment of Uhlans. He was sent, as Austria’s representative, to the celebrations of Queen Victoria’s Diamond Jubilee in 1897. An imperial edict of 1898 appointed Franz Ferdinand to undertake some duties on behalf of the High Command so that he could be become better acquainted with the armed forces of the Empire. He would be granted access to all appropriate state papers . Our belittled and insignificant archduke was on the up again, being treated with the respect his position deserved. But then it nearly all came tumbling down by his choice of consort. The Habsburg court was very particular about who a member of the family could marry – it was restricted to any Catholic royals in the first section of the Almanach de Gotha – leading to many Habsburgs intermarrying with cousins (Franz Joseph and Sissi were first cousins for example), and there were many consequent genetic problems and miserable relationships. Franz Ferdinand had an antidote to this because he had fallen in love with a lady-in-waiting. 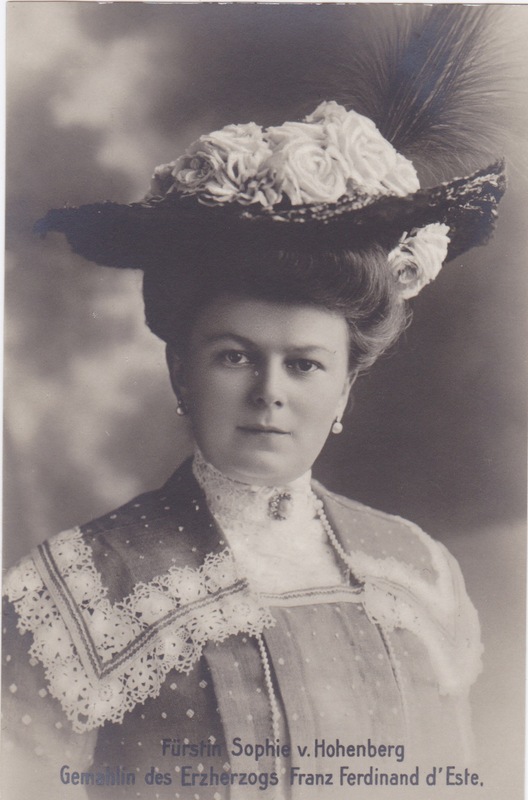 She was not just any lady-in-waiting, she was a Bohemian Countess, the daughter of the above mentioned Ambassador to Belgium, and her name was Sophie Chotek. It is impossible to say when this relationship started. The standard assumption is that they met at a ball in Prague in 1894 though it should be noted that Sophie’s sister, Countess Marie, married Franz Ferdinand’s hunting companion, Count Jaroslav Thun-Hohenstein, in 1887. And in 1888, Sophie began working at court for Archduchess Isabella . We will never know; they never told their children. What we do know is that Franz Ferdinand’s doctor reported that his two year tuberculosis exile was enlivened by regular letters from somebody – he assumed a lady. 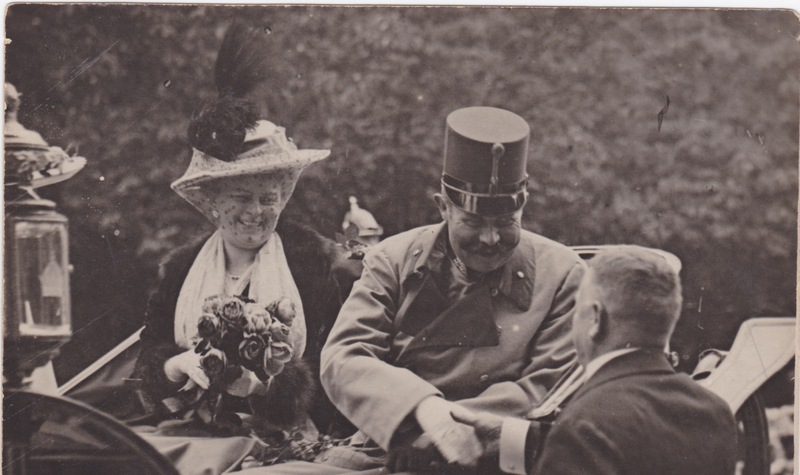 And Archduchess Isabella was aware that Franz Ferdinand’s regular visits to her home in Pressburg (now Bratislava in Slovakia) were not just jovial family events. She knew she had to make sure Sophie was present whenever Franz Ferdinand was around . Time was ticking along though. Franz Ferdinand was in his mid-thirties and Isabella hoped that, despite Sophie’s presence, the archduke would marry her eldest daughter (1 of 6 daughters! ), Maria Christina. This was not to be. In April 1899, Franz Ferdinand left his watch chain behind after a tennis party in Pressburg. A servant handed it to Isabella. Noticing a locket attached to the chain, she opened it. Sophie’s photo was contained inside. Isabella flew into action, banishing Sophie from her home and going to Franz Joseph to demand action. Action was taken, Franz Joseph asked his nephew to renounce the Countess. Franz Ferdinand refused. Months of wrangling followed with Franz Ferdinand supported only by his stepmother, Maria Theresa, and Rudolf’s unhappy widow, Stephanie. Eventually, a compromise was reached – Franz Ferdinand had to agree to a morganatic marriage swearing an oath that he would never raise his wife to be his equal, that she would never be his Empress, and that his children would never be able to “lay claim to those rights, honours, titles, coats of arms, or privileges”  that other Habsburg children would acquire. 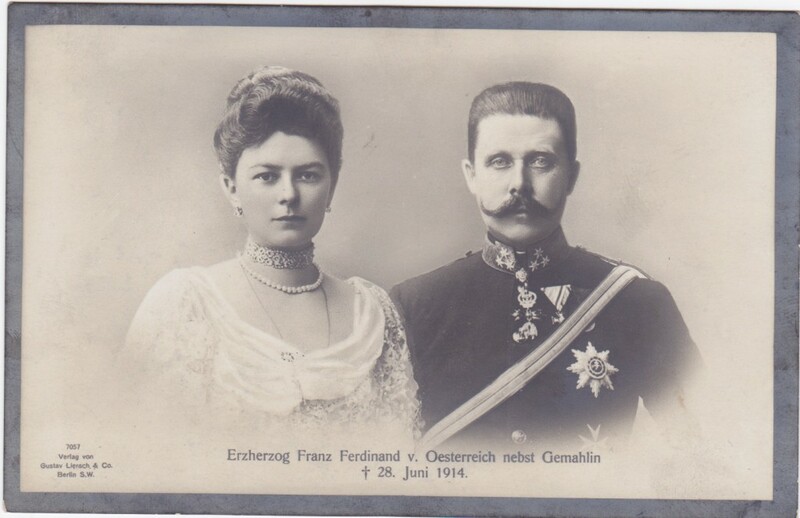 They wedding took place on 1st July, 1900, far from Vienna, much more quietly and insignificantly than the Heir to the Habsburg throne’s nuptials should have been. And in the pattern we have seen emerging in Franz Ferdinand’s life, he had moments of significance and insignificance as he spent the next fourteen years as heir. There is no doubt that his marriage was the best thing for him. He himself declared this in a letter to his stepmother – “Soph is a treasure and I am indescribably happy! She takes such good care of me … I feel as though reborn”  But Sophie was condemned to a twilight world where she could appear at court but was unable to accompany her husband due to her lowly status. She could not enter a room on his arm, she could not sit next to him at dinner, she could not take part in any State functions. So Franz Ferdinand kept away from court as much as he could, which diminished his influence and kept him out of the public light. Protocol was a real issue at the Austrian court but so was the Emperor’s age – he was 70 in 1900. If the Court could not recognise that it needed to look to the future, the rest of Europe did. The rest of Europe was rather more open minded as well – for example, the Duke of York in Great Britain was married to the granddaughter of a mere Countess, too. So Franz Ferdinand found that he was significant enough to be courted by other rulers. It started in 1903 with the Kaiser arriving on a state visit. Bernhard von Bülow, his chancellor, advised Wilhelm that if he paid attention to Sophie, he would win the friendship of Franz Ferdinand for life. The Kaiser was horrified by the idea, but as he was greeted by Franz Ferdinand at the railway station in Vienna, he asked when he would be able to meet Sophie. They all had tea together later that day. Sophie and Franz Ferdinand were later invited to visit the court in Berlin where she received all the honours due to an heir’s wife. In 1909, they were both invited to Romania by King Carol I and in 1913, there was a visit to the above mentioned Duke of York who was now King George V. These visits were mainly considered private, or at least semi-official and became known as Franz Ferdinand’s “shooting box diplomacy” as all visits involved some kind of shooting diversion – shooting being Franz Ferdinand’s favourite hobby. And through these visits Franz Ferdinand established diplomatic relationships abroad both for himself and his country. At home, Franz Ferdinand was still aware that his education had been somewhat lacking and sort to remedy that by setting up his own alternative chancellery at his official residence, the Belvedere Palace in Vienna. It was headed by Major Alexander Brosch and intended to develop policies that Franz Ferdinand would implement when he became Emperor. 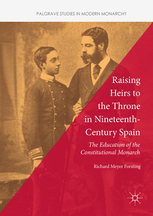 Many saw it as a rival to the government of Franz Joseph but it was more akin to Franz Ferdinand doing a degree in being an Emperor. Gradually, Franz Ferdinand was allowed to see more official papers. Brosch stated, “The Archduke is highly gifted; he has a really incredible quickness of perception and a sure eye, especially for military conditions” . Franz Ferdinand’s most astute act in the run up to 1914, was his perpetual opposition to Franz Joseph’s Chief of Staff, Franz Conrad von Hötzendorf. Conrad was determined to wage war on Serbia, especially after it opposed Austria’s annexation of Bosnia-Herzegovina in 1908. Every few months, he would suggest it, every few months Franz Ferdinand would vehemently argue against it. The Archduke understood the bigger picture – if Austria went to war with Serbia, Russia would rush to support its Serb brothers and declare war on Austria. The treaties tying Europe together would create a pan-European war that would probably lead to the downfall of at least the Habsburg monarchy if not others too. If only Franz Ferdinand’s warnings had been remembered in July 1914. 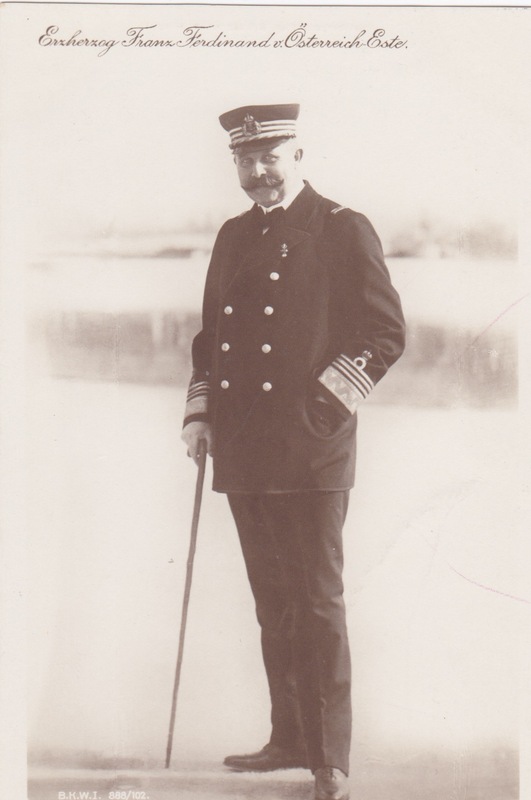 By June 1914, Franz Ferdinand had been made Inspector-General of the Armed Forces – he was delighted by this and it was a hugely important recognition of his position and his hard work. As such he was expected to go to Sarajevo to observe the military manoeuvres in the hills above the city. It was just a military occasion until the Governor General, Oskar Potiorek, decided it would be a feather in his cap to ask the Archduke and his wife to visit the city itself. Franz Joseph wanted nothing that would overshadow the success of his trip in 1910, and Franz Ferdinand knew Sarajevo was politically unstable, and was not happy about an official appearance. So only a short, half day visit was agreed upon for 28th, and Sophie was to be allowed full honours for the first time. This is not the place to tell the story of that fateful day but it has to be noted that it might not have been so fateful had there been proper security arrangements. For a start, Potiorek had not warned Franz Ferdinand that 28th June was St Vitus day – the Serb national holiday marking the 1389 Battle of Kosovo which ended in their bloody defeat to the Ottoman Empire. Potiorek also declared his police force would be able to cope with the visit – ignoring the 22,000 soldiers manoeuvring nearby who might have been able to assist with security. Half that police force was on a day off as it was a Sunday. Potiorek was warned by both his own officials and by Austrian ones including the Foreign Office, the Ministry of the Interior and military intelligence, that there was definitely a threat to the Archduke – he took no notice as he was supremely confident in his arrangements. And nothing was officially done by anyone to supervise Potiorek because nobody really cared enough about Franz Ferdinand – the security provided for the Emperor’s visit had been positively fierce compared to that of 1914. And so, the only person in June 1914 who saw Franz Ferdinand as significant was Gavrilo Princip and his fellow conspirators – and they assassinated both Franz Ferdinand and Sophie. When Franz Joseph was told, he remarked, “A higher power has restored the old order that I unfortunately was unable to uphold” . This was, of course, a reference to Franz Ferdinand’s marriage but it set the tone for the funeral arrangements. Franz Ferdinand’s will left instructions that he was not to be buried in the Habsburg’s gloomy Kaisergruft in central Vienna, but at his castle outside Vienna, Artstetten. This he had planned so he could lie forever next to Sophie who would be denied entrance, in death as well as in life, to her place within the Imperial family. The court officials used this, and Sophie’s status, as a wonderful excuse to deny Franz Ferdinand a proper state funeral. The bodies only lay in state in Vienna for four hours compared to a whole day for Rudolf. Military officers were ordered not to take part as the funeral cortege passed through Vienna. The funeral service took place in the tiny Hofburg chapel and not a church capable of holding decent numbers. Foreign royals were asked not to attend – the Kaiser was particularly upset by this. 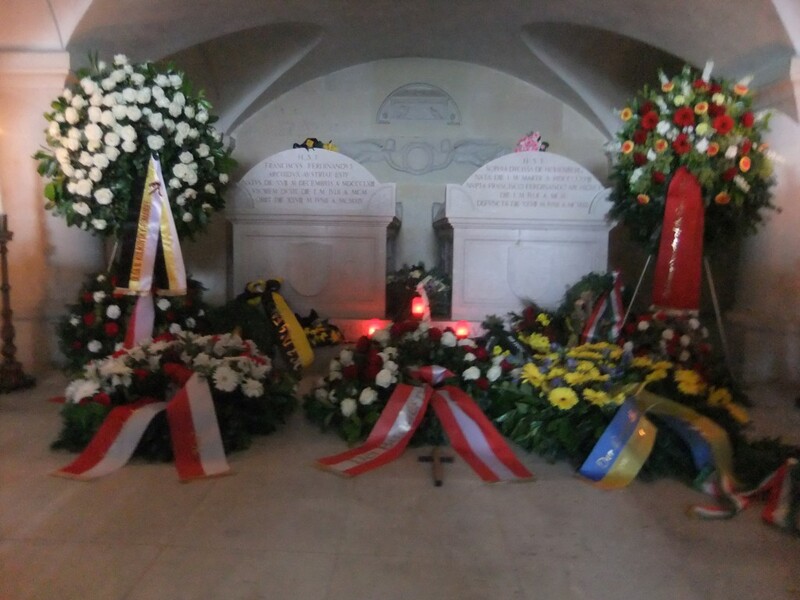 There was rebellion amongst even Habsburg archdukes and they followed Franz Ferdinand’s and Sophie’s coffins all the way to the chapel in Artstetten for a service followed by internment in the crypt. And there the devoted couple still lie, in identical white marble tombs, engraved with the words “Joined in marriage, they were joined by the same fate”. This should be the end of the story of Franz Ferdinand’s insignificance, but it continues. If you go to Vienna today, it is as if Franz Joseph, Sissi and Rudolf still live – their images are everywhere. You can look as hard as you like, but you will not find a portrait of Franz Ferdinand in the Hofburg. With the centenary of his assassination, there was one exhibition held in Vienna concentrating on his trip around the world – it took place at the Natural History Museum which was founded on the collection of items Franz Ferdinand brought back. In 2016, the centenary of the death of Franz Joseph, there were 5 exhibitions in and around Vienna about all aspects of his life and reign. Artstetten is open to the public as a museum to Franz Ferdinand, run by the couple’s great granddaughter, HSH Princess Anita Hohenberg. But the couple’s favourite home, Konopiste, is in the Czech Republic and this was seized from the couple’s three young children in April 1919, when all Habsburg properties in the Czech Republic were expropriated by the government. Seizure of Habsburg properties was legalised when the Treaty of St Germain-en-Laye was ratified in September of that year. As shown above, the children did not have the right to be called Habsburgs, their family name was Hohenberg. Konopiste was owned by HH Max, Duke of Hohenberg, and the seizure was illegal. Inside were all the family memories, the photographs, the letters, the toys, the clothes …. the orphaned children lost them all – no officials considered them significant enough to defend them. Like Artstetten, Konopiste is open to the public. Another of Franz Ferdinand’s great granddaughters, HSH Princess Sophie Hohenberg, has been fighting for restitution of the castle and its contents to the family. Her case has been rejected by both the Czech and European courts. She will continue to fight, and it would be a significant triumph if she eventually succeeds. She will leave Konopiste open to the public but will make sure that Franz Ferdinand gets the recognition he deserves. Note some references are cited twice intentionally. All images: author’s private collection.